Feather River College offers a “hands on” approach to learning, students can focus on a variety of industry topics including horse training skills, packing skills, ranch skills, rodeo skills and agriculture. Are You Looking For A Rewarding Career With Horses? For most people their career lasts a lifetime and requires a huge investment of time, energy, and thought. Why not have a career that can be rewarding? When are doing what you love, work becomes a joy. If you love horses, Feather River College can help you turn your passion for horses— into a rewarding career for many years to come! Why Should I Choose Feather River College? Feather River College is a small college that offers students a wide variety of educational opportunities and our dedicated instructors are eager to help students achieve their goals. The Agriculture and Equine Studies Departments help student’s to gain knowledge through a comprehensive, hands on learning environment. They know the best way to absorb what is taught in the classroom is to apply it to real situations. Is It True That Feather River College Can Help Me With A Ranch Management Degree? Yes! The Equine and Ranch Management Bachelor’s Degree Program enables students to emphasize their degree work in areas that are of most interest to them in the Ag industry. These areas include animal production (equine and/or beef cattle), resource management and business operations. These courses do not limit students in their career opportunities, but are designed to help students prepare for a wide variety of career options such as the management of a horse or beef cattle facility, Ag marketing and sales, apprentice with a horse trainer or starting their own business in the Ag field. Make sure to see our Course Descriptions to help select the right program for you! How Long Will It Take For Me To Get My Equine Ranch Management Bachelor’s Degree? The Equine and Ranch Management Program is fully accredited Bachelor’s Degree, which usually will take a minimum of four years to complete if the student begins as a Freshman. If, the student transfers into the program from another institution and they meet the lower division requirements, it can take as little as two years to earn the degree. What Other Kinds Degrees Are Available Through Feather River College? 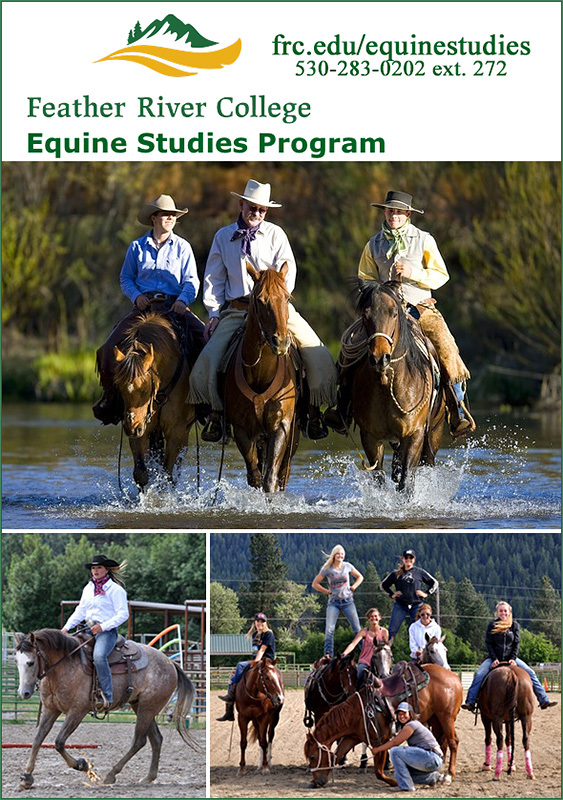 In addition to the Equine and Ranch Management Program, Equine Studies and Agriculture degrees, Feather River College has many interesting degrees. Some of these options include, Administration of Justice, Outdoor Recreational Leadership, Environmental Studies, Early Childhood Development and Vocational Nursing. No matter your area of interest, there is a little something for everyone. What About Housing While I Am There? Feather River College provides a living environments that enhances the educational and personal growth of students and provides a community atmosphere that complements the educational mission of the College. * The Meadows Apartments is an apartment complex near downtown Quincy that features one and two bedroom (double occupancy) options. Preference for this complex is given to returning students with no disciplinary records. * The Pines (opening fall of 2017!) , which is located in the heart of Quincy, will provide a traditional dorm setting with double occupancy rooms located off two corridors; one for men and one for women. Note: Off Campus Housing is available and we are happy to help you with information on those options. The Financial Aid Office’s mission is to provide all Feather River College (FRC) student’s educational opportunities through the delivery of student federal and state financial aid and scholarship programs. To insure compliance with federal, state, and institutional statutory and/or regulatory requirements associated with the delivery of student financial assistance and financial resources. The financial aid staff is dedicated to assisting students and families in obtaining funds to cover college costs in an equitable manner. There are a variety of different types of financial aid funded through federal, state, local organizations, lending institutions, and FRC itself. Although the application process may seem complex, we are here to help you every step of the way. Our goal is to see that financial problems do not prevent you from achieving your educational goals. What Do Students Say About Their Experience At Feather River College? First, we are happy to talk to you to help you every step of the way! The Bachelor of Science Program requires a separate application and does not have an open enrollment policy. These applications are reviewed by a committee for acceptance into the program. All other degree programs, Feather River College is an open enrollment institute. This means, students who complete the application process and meet eligibility requirements are allowed to sign up for courses, as long as, they meet the prerequisites where applicable. We welcome your calls and are excited to meet you at Feather River College soon!